I have a confession to make before I start this review: As a child, Beauty & the Beast, the Disney version, scared the living hell out of me. I never quite grasped the fact that the Beast had no intention of ever hurting Belle, nor did I have the good sense to appreciate that INSANELY fantastic library of his. I just knew that dude was terrifying to look at, and just kept hoping Belle would find a way to escape, dancing utensils be DAMNED. Needless to say, I was not expecting a retelling of the beloved classic to hold any sort of interest for me. I expected copious amounts of eye-rolling, "oh please" *sighing*, and enough flowery words to make me nauseated. What I wasn't expecting, was to fall in absolute mind-gripping, soul-wrenching, LOVE with Cruel Beauty. Nope, that came RIGHT out of left field. Upon opening, the back story is laid out: Nyx is destined for a fate that was determined the moment she was born. Instead of her twin sister, Nyx was chosen as the future bride, and executioner, of the Dark Lord: a sinister demon who rules her land. She is trained in combat, and armed with the knowledge she needs to eliminate the enemy, and save not only her family, but her entire town of Arcadia. Her resentment runs deep, and that point is driven home with intense force throughout the entire first 3rd of the book. Why was she chosen, and not her sister? How could her father willingly hand-deliver his own flesh and blood to her death? Once in the castle, Nyx quickly learns that although her mission is clear, her heart has other plans. The author was dead set on creating a tone of angst, and fury, and grim determination. Which led to my only qualm with Cruel Beauty: the fact that Nyx is constantly in a rage over the unfairness of her fate. She despises the naivety of her sister, and can't seem to find love in her heart for anyone in her selfish family. She hates them. She curses them. She hates them. Did I mention that she hates them? Because the author did, many times. I feel like that fact could have done well with one proper mentioning, and then left alone for the remainder of the book. The reason for my 4 stars came in the form of a bargain-wielding demon: Ignifex. I could have cared less for Shade, Ignifex's twin-faced shadow, who Nyx initially thinks she's found a connection with. No, my 4 stars was birthed within the last 3rd of this book, when Nyx begins to fall inappropriately, and deliciously, in dangerous love with the enemy. I loved the castle, and it's ever-changing rooms. I welcomed the moments of Greek Mythology explanations, and thought it only added positively to the atmosphere of the narrative. I thought Rosamund Hodge created something that had the ability to fall flat on it's face, but kept me hooked in ways that I might be embarrassed to admit out loud. I was definitely in the mood to read this book, filled with it's gothic town, archaic traditions, MAGIC, and best of all: forbidden love. 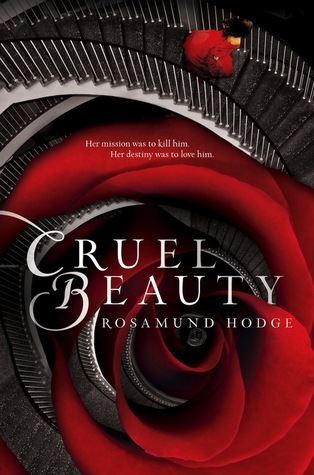 It may not be for everyone, but in the time it took me to read Cruel Beauty, it was for me. Recommended for fans of: Fairytale retellings, Beauty & the Beast, Romance, Fantasy, Magic, Mythology, Paranormal. I liked this too, but the beginning was a little annoying as Nyx had to continually drive home her point over how much she hates everyone. Great review!